If you like our sleigh style storage bench, but are looking for something a little larger, we have just the thing for you - the four-panel version of our raised panel sleigh storage bench! 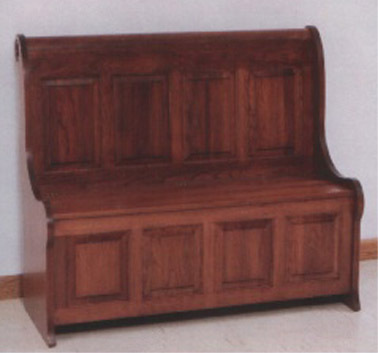 You can’t beat Amish quality, and this bench is sure to become a family heirloom you can hand down through the generations. Not only will it look attractive in your home, but the top opens to reveal a large storage area where you will be able to stash all manner of things. The four panel sleigh bench is available in two sizes - the one you see here, and another that is nearly 13 inches longer!